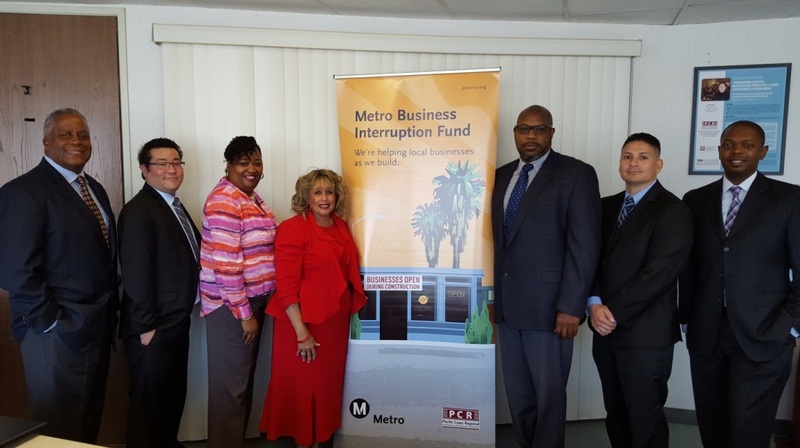 Metro launched its first ever pilot Business Interruption Fund (BIF) in spring of 2015. The BIF is focused on providing financial assistance to “mom and pop” businesses directly impacted by transit rail construction along the Crenshaw/LAX Transit Project, the Little Tokyo area and 2nd/Broadway segment of the Regional Connector and the Purple Line Extension, Phase 1. Metro contracted with Pacific Coast Regional Small Business Development Corporation (PCR) to serve as the BIF fund administrator. Serving as the fund administrator, PCR brings over 30 years experience supporting small business communities throughout Los Angeles County. In collaboration with Metro; the dedicated team of business professionals has been instrumental to Metro awarding over 200 grants to small “mom and pop” businesses in a total amount exceeding $3.7 million. The Business Advisors are Metro’s “boots on the ground” when it comes to supporting directly impacted small businesses and helping them get financial assistance through the BIF. Business Advisors perform ongoing outreach, provide one-on-one support to business applicants and demonstrate continued engagement to the business communities along the three major construction projects. To learn how to apply for Metro’s BIF, visit pcrcorp.org or contact Angela Winston at 213-739-2999, extension 223. For more information about the BIF program, click here. H*E*L*P……How do I apply for a Senior Metro Goldline Pass? Will appreciate any assistance. Thank you very much in advance. To apply for a senior TAP card, please fill out the form available at metro.net/fares. You can mail it in or bring it in to a Metro Customer Center. If you need assistance, we encourage you to call 323.GOMETRO.